Quality Air Heating and Air Conditioning > Articles > Heating > How Does an Old Air Filter Affect my Heating in Columbus OH? How Does an Old Air Filter Affect my Heating in Columbus OH? 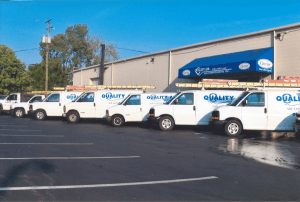 When it comes to heating, Columbus, OH residents are experts. Our winters are as cold as they come and a reliable heater is the best means we have to keeping our homes cozy and comfortable. Basic maintenance includes regularly replacing the air filter, an operation that you can conduct yourself or leave to a repair technician as part of a larger maintenance service call. If you don’t replace the filter regularly, it can have an impact on your system as a whole. The filter basically strains dust and debris form the air, keeping it from entering your system. This can have a huge, yet subtle effect on the functioning of your furnace. When dust and dirt build up inside your system, they increase the amount of friction between moving parts, as well as interfering with other key components. In and of itself, it’s not enough to stop the heater from functioning, but it does add to the wear and tear. This has two effects: first, it forces your heater to work harder and expend more energy, increasing your monthly bills in the process. Second, that extra wear and tear increases the risk of a more serious breakdown in the future, necessitating more expensive repairs. In addition, dust that doesn’t get caught in the filter could end up in your distribution system: pushed through your home and lowering the overall quality of your indoor air. This can be particularly troublesome if anyone in your household suffers from allergies: irritating the nose and throat and making existing conditions worse. You can avoid all of that simply by replacing your old air filter with a new one, or (if your filter is reusable) washing and cleaning it regularly. For a more thorough discussion on how an old air filter affects your heating in Columbus, OH, contact the pros at Quality Air Heating and Air Conditioning. Our experts can set up a maintenance schedule for your heater, which includes air filter replacement. Pick up the phone and give us a call today!